Jonathon Shafi reports direct from Brazil as resistance and protest mounts against the Bolsonaro regime. Just two days after the election of Bolsonaro we have seen the first expression of resistance to the attacks on democracy and civil rights that lie ahead. 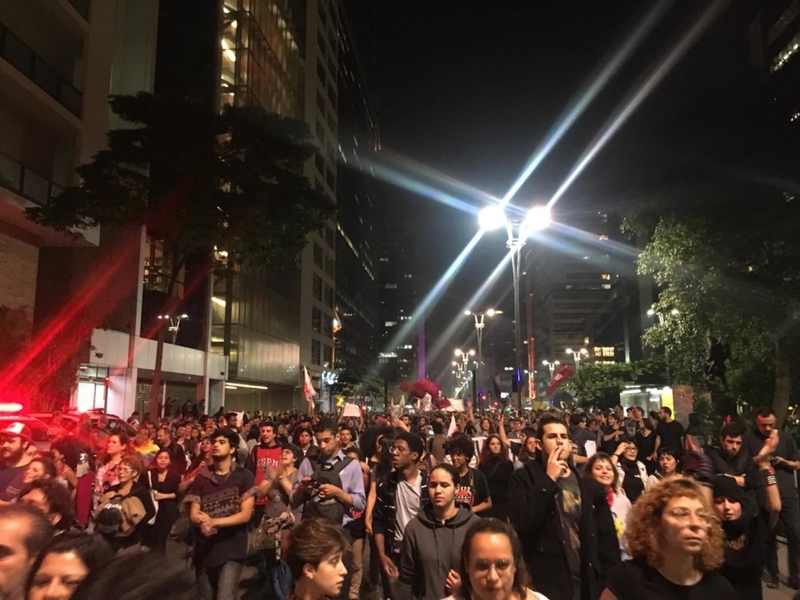 Brazilians took to the streets in towns and cities across the country under the banner: “no fear – we will resist.” This act of defiance will be the first of many, and there is no disguising the fact that a very difficult struggle lies ahead. This in part is why the spirit of these demonstrations was so striking. 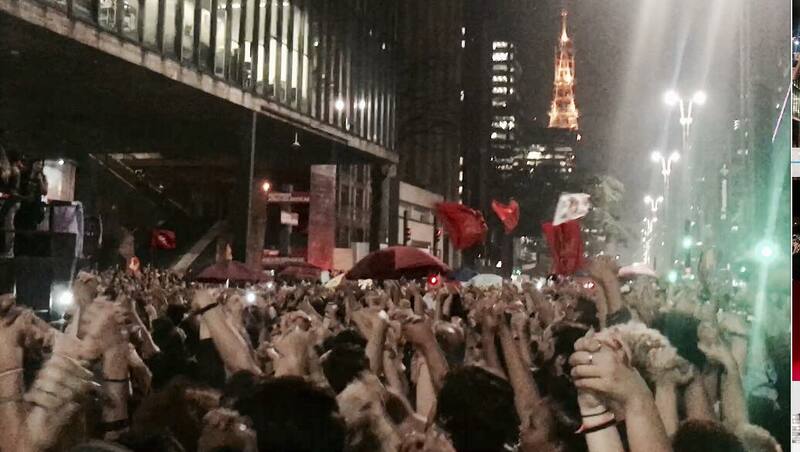 I joined tens of thousands of people in Sao Paulo. Yes – the numbers were important. But I’ve rarely seen the kind of energy on a demonstration before as that on display here. Young, old, families – a cross-section of Brazilian society marched. Bear I mind that this show of strength takes place in the context of a crushing blow in the election of Bolsonaro, and after weeks of tireless campaigning. Such tenacity should be an inspiration to us all. Bravery too. As the demonstration progressed there would be various points with groups of military police. Helmets, balaclavas and guns. And yet the demonstrators chant anti-military slogans as they march past. The political struggle has generated courage in the face of the power of the state. That is going to be necessary in the months and years ahead. Millions across the country will take heart from these demonstrations. But there is a long way to go. There will be a crack down on the opposition in various ways over time. This is why demonstrations are not the only tool. This is a long-term struggle that lies ahead. There are no illusions about this. Groups are meeting and organising mechanisms of self-defence and to increase security. Not just political groups, but all those communities that face repression. In a sense, part of successfully opposing Bolsorano will involve remaining intact. It won’t always be tens of thousands on the streets. A more protracted and multi-layered strategy will be needed. As we marched past the hospital, sole nurses came out and were greeted with huge cheers. People danced in front of traffic to bring the city centre to a stand still. A gay couple kissing at the side of the demonstration were the subject of applause as the march passed by. Such simple things are acts of resistance in Brazil now. At moments the whole crowd would join hands. It doesn’t matter who you are – if you are on the demonstration you are part of the resistance and treated as such. Because of the intensity of the situation politically, social solidarity arises in a concentrated manner, since there is an instinctive awareness reliant on everyone else in the fight that is to come. I speak to an activist after. She says: “We have a long way to go. He’ll become president in 2 months and we already feel the fear and destruction.” It hits me that the question of calling and attending a demonstration is not always going to be a simple thing to do. That risks will most likely increase. That the movement is going to have to have a diverse life system to keep it going. Culture, music, art: all will play a central role in maintaining resistance. As such no one is carried away by the demonstrations. There is a focus and a realism too. This is vital, because the movement must be able to sustain itself for a long time. It must be able to suffer defeats and losses. This is not a political game – what happens now and the tactics adopted by the movement will shape the outcome. We too have a job. We have to build an international solidarity movement with Brazil. Believe me – it makes a difference to the morale of the people on the ground here. And moral is the lost precious substance a movement can ever have. Everyone I have spoken to in recent days stresses the need for international support. They cannot feel alone. We need to rise to the task – and our task is a walk in the park compared to theirs. But we also have to build an international movement against the far-right and the causes of the far-right. That movement will be joined by millions of Brazilians who are now engaged in what will be a courageous, difficult and vital struggle. There is no alternative. The only thing left to do now is to survive, and to fight. To haul back basic rights. And to build a new society. Go along to Eye Witness; the Brazilian Elections and the Rise of the Far Right this Friday at the CCA. I am confused. My friends in Brasil, who have always been Liberal/left leaning, are telling me that this vote was necessary at this time? If Bella Caledonia wants to be taken seriously, it has to avoid confusing what it would like to be happening with what is actually happening. 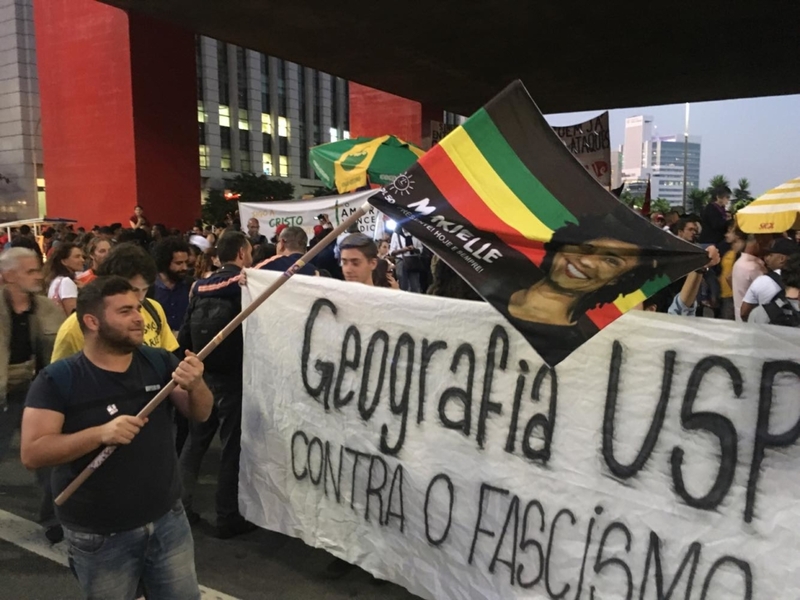 It was clearly a reference to the people likely to be oppressed under this regime coming together, as described in our eyewitness reporter from Sao Paulo. Maybe so, but to call them “Brazil” is misleading and exclusive. It also suggests that the majority of Brazilians who voted for Bolsonaro have no legitimate concerns or right of expression. Please do not take this to mean that I condone Bolsonaro. In fact, I think he is as hideous as you do. But for better or for worse, he is Brazil’s choice, at least for now. It’s the way RISE people and their ilk, think speak and write – like political reality can be and indeed must be abstracted and reduced down until it can be scrawled on a placard, as a matter of ethical urgency. It’s in their post-Leninist DNA. Which is not very useful DNA in the 21st century, it appears. God, RISE-hate. Get a grip of yourself. Do you think the mobilisation against the G20 summit in Buenos Aires at the end of November could be a useful exercise in pulling together social movements both within and outwith Brazil (but particularly from other Latin American countries) against the new Bolsonaro government? I realise Temer will be there instead of Bolsonaro as the summit ends a day before his inauguration – but my instinct is that it could still be an important expression of international solidarity with those facing a new authoritarian right-wing government in the region. The organisers are in urgent need of assistance with international fundraising.